Received 7 January 2010; revised 11 January 2010; accepted 15 January 2010. H5N1, human H5N1, avian H1N1, and swine H1N2. 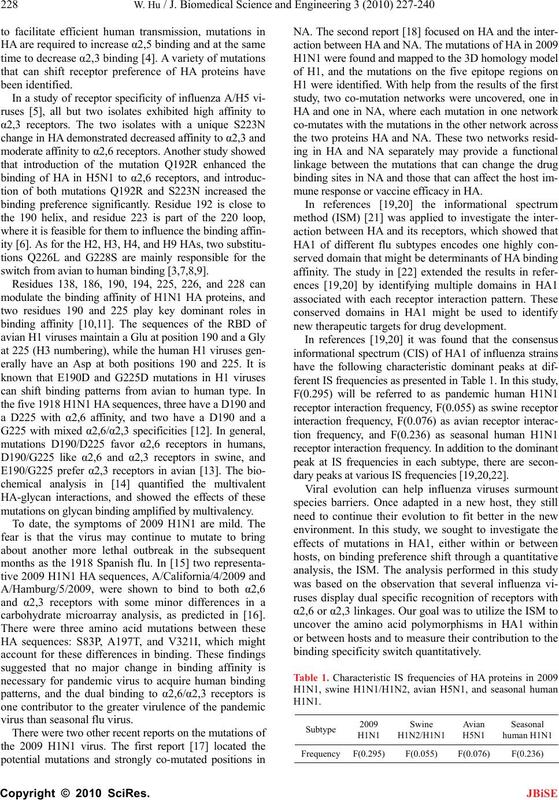 receptor specificity of HA proteins is a key determinant. ages in the lower respiratory epithelium of humans . switch from avian to human binding [3,7,8,9]. mutations on glycan binding amplified by multivalency. carbohydrate microarray analysis, as predicted in . virus than seasonal flu virus. 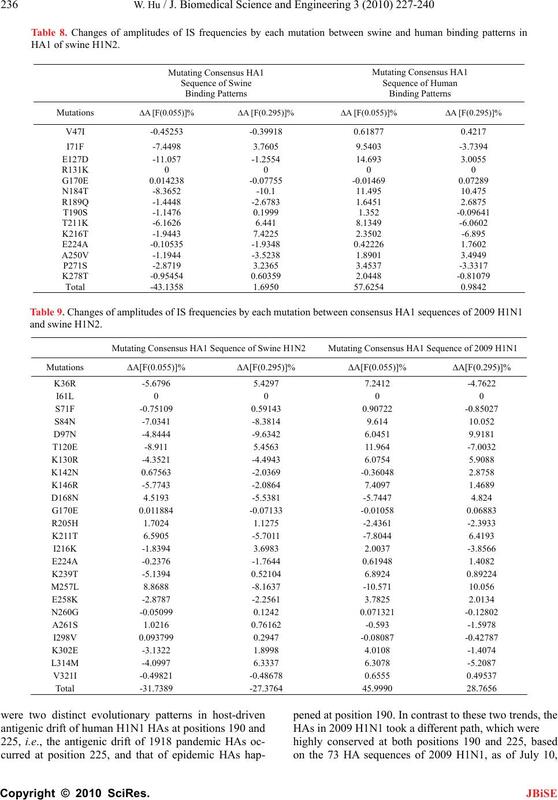 mune response or vaccine efficacy in HA. new therapeutic targets for drug development. dary peaks at various IS frequencies [19,20,22]. loop and 220 loop, respectively [25,26]. the full length and unique sequences were selected. H1N1 sequences with a deletion at position 127. Table 2. 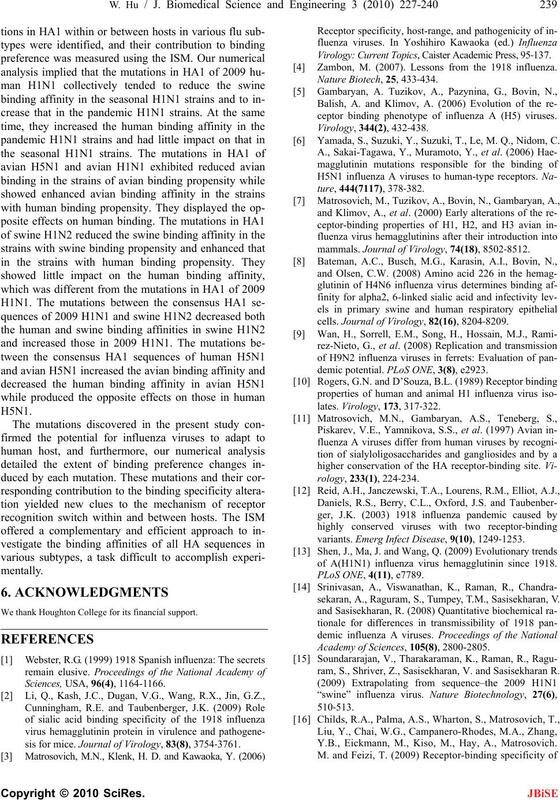 Mutations between swine and human bindings in HA1 sequences of 2009 H1N1. 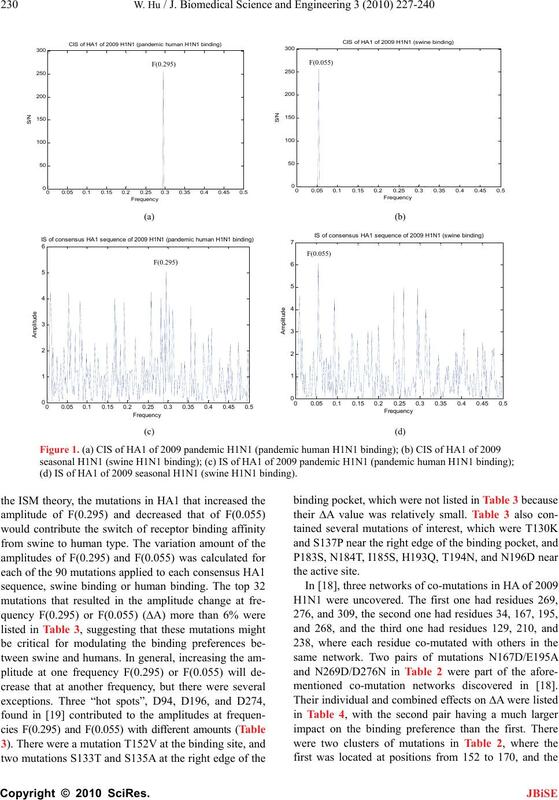 (d) IS of HA1 of 2009 seasonal H1N1 (swine H1N1 binding). mentioned co-mutation networks discovered in . Table 3. 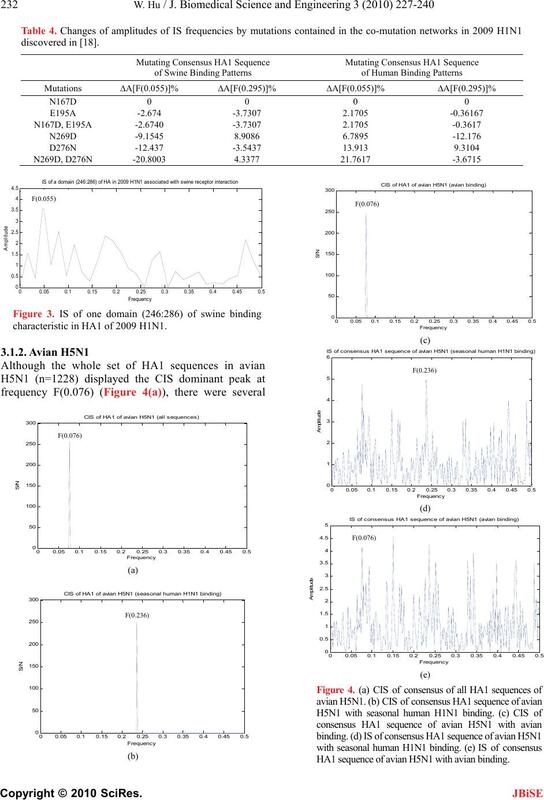 Changes of amplitudes of IS frequencies by top 32 mutations with large ∆A value in HA1 of 2009 H1N1. at frequency F(0.055) (Figure 3). seasonal H1N1 (swine binding). The binding sites in HA are colored in red, the left and right edges of the binding cleft in blue. characteristic in HA1 of 2009 H1N1. HA1 sequence of avian H5N1 with avian binding. active site: D154N, N155S, A156T, and R189K. verify this fact numerically (Table 7). le 7. Ch amplitudecies by mG225D. 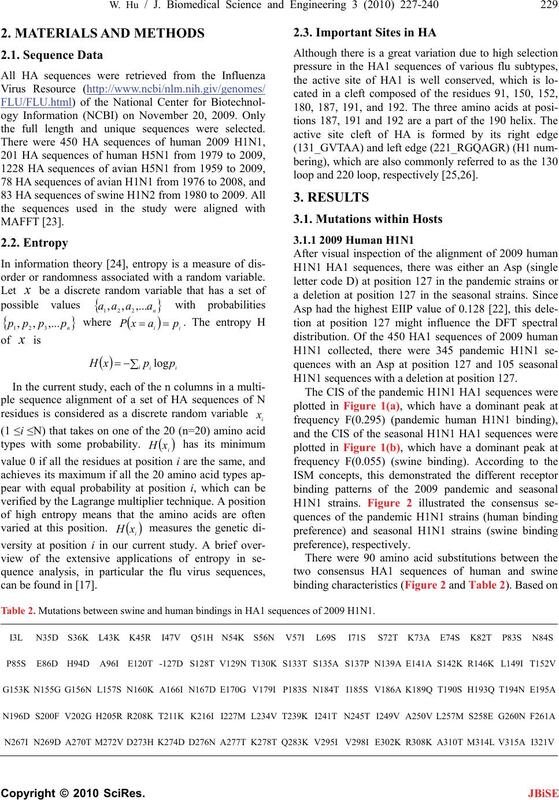 00.05 0.10.15 0.20.25 0.30.35 0.4 0.45 0.
sequence of avian H1N1 with avian binding. from the classical swine influenza viruses. 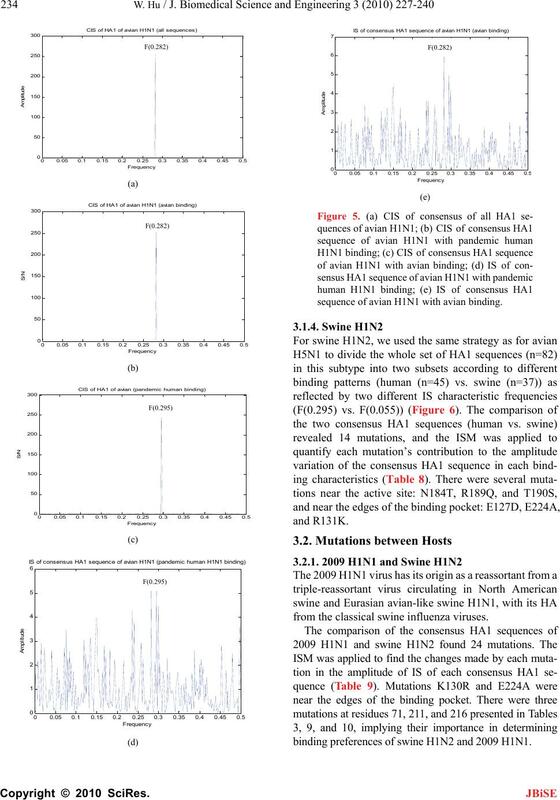 binding preferences of swine H1N2 and 2009 H1N1. 00.05 0.1 0.15 0.20.25 0.3 0.350.40.450. H1N1. 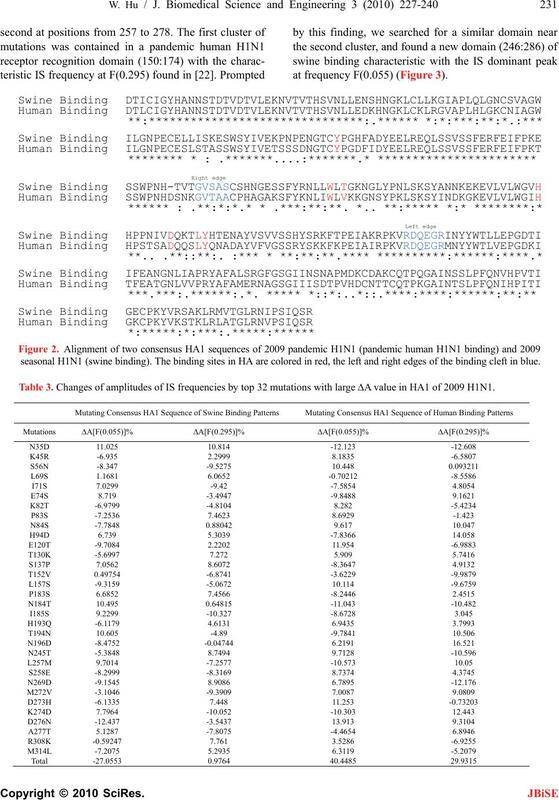 (b) IS of consensus HA1 sequence of swine H1N2. 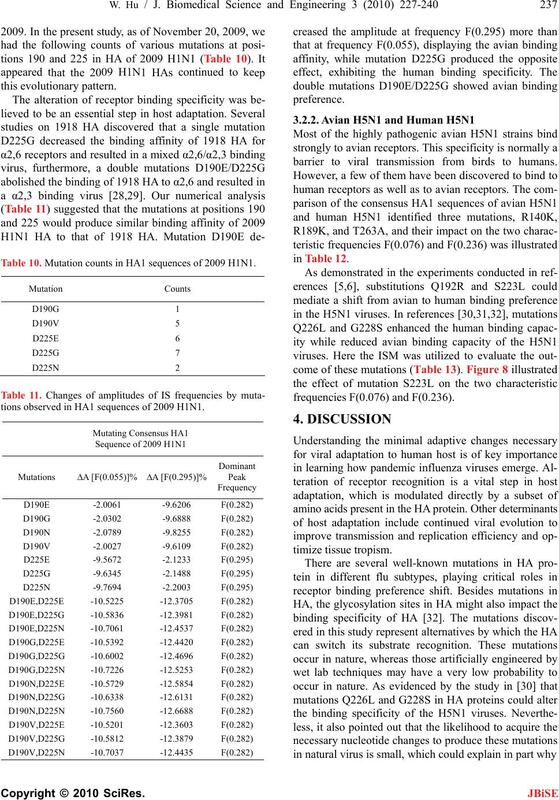 tions observed in HA1 sequences of 2009 H1N1. barrier to virmission fromto humans. tions experimented in references [5,6,30,31,32]. We thank Houghton College foinancial support. sis for mice. Journal of Virology, 83(8), 3754‐3761. 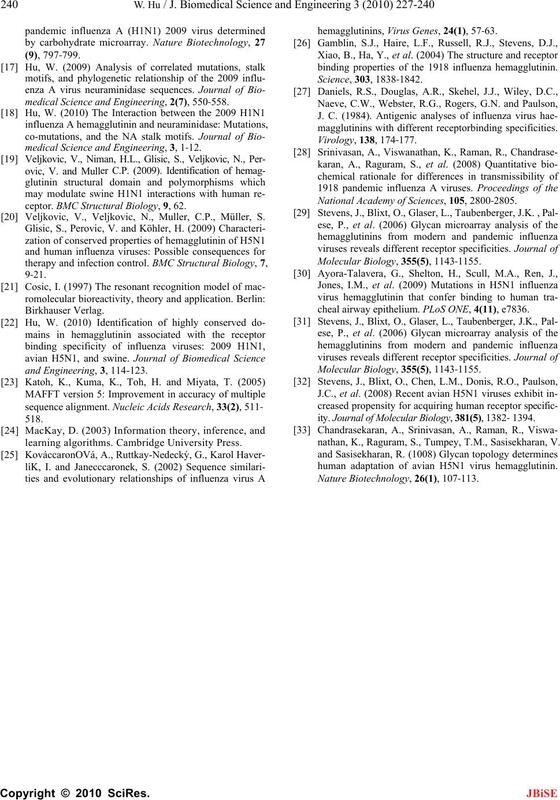 Virology: Current Topics, Caister Academic Press, 95‐137. Zambon, M. (2007). Lessons from the 1918 influenza. Yamada, S., Suzuki, Y., Suzuki, T., Le, M. Q., Nidom, C.
mammals. Journal of Virology, 74(18), 8502‐8512. cells. Journal of Virology, 82(16), 8204‐8209. demic potential. PLoS ONE, 3(8), e2923. variants. Emerg Infect Disease, 9(10), 1249‐1253. 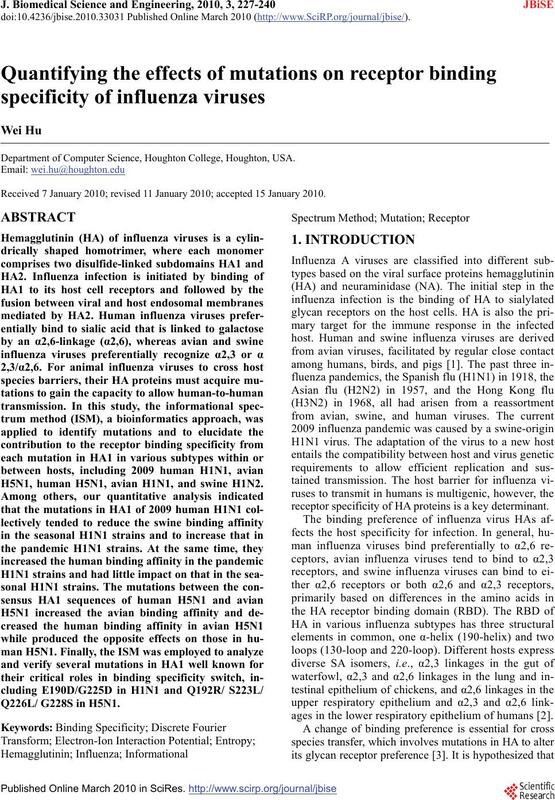 of A(H1N1) influenza virus hemagglutinin since 1918.
sekaran, A., Raguram, S., Tumpey, T.M., Sasisekharan, V.
Academy of Sciences, 105(8), 2800-2805.
ram, S., Shriver, Z., Sasisekharan, V. and Sasisekharan R. Y.B., Eickmann, M., Kiso, M., Hay, A., Matrosovich. al Science and Engineering, 2(7), 550‐558. medical Science and Engineering, 3, 1‐12. o- magglutinins with different receptorbinding specificities. Veljkovic, V., Veljkovic, N., Muller, C.P., Müller, S.
ity. 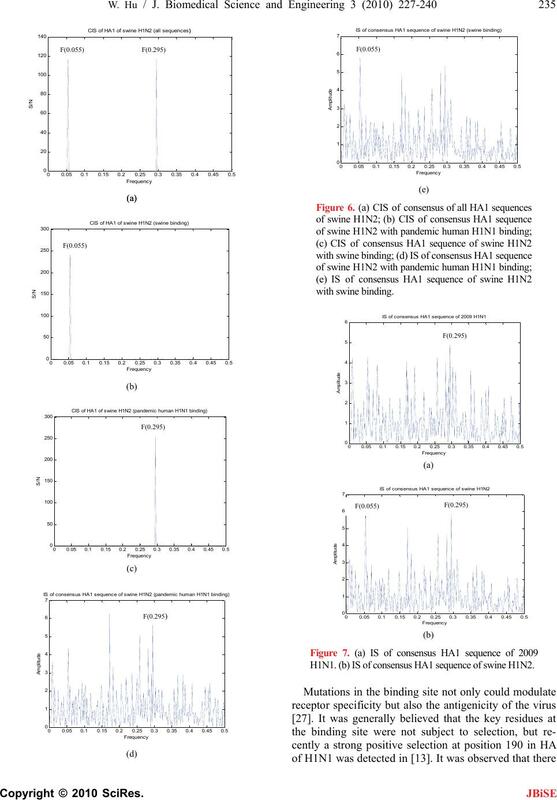 Journal of Molecular Biology, 381(5), 1382‐1394. hemagglutinins, Virus Genes, 24(1), 57‐63. National Academy of Sciences, 105, 2800‐2805. cheal airway epithelium. PLoS ONE, 4(11), e7836. 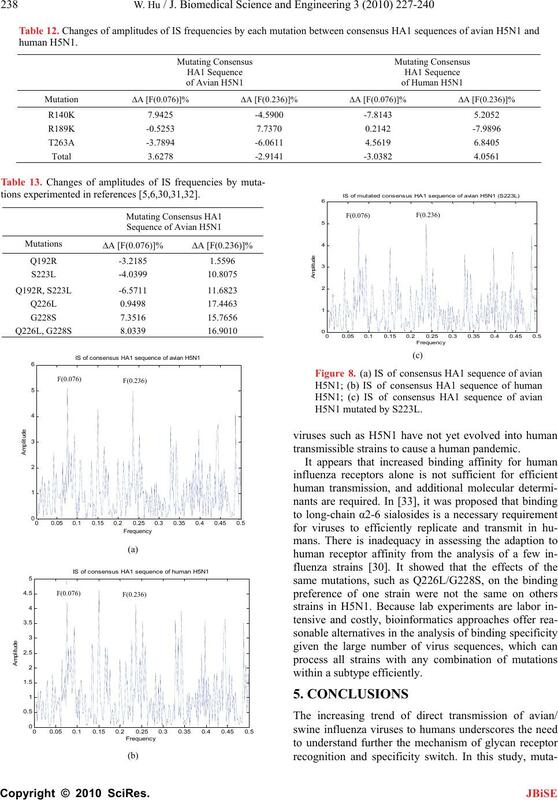 nathan, K., Raguram, S., Tumpey, T.M., Sasisekharan, V.
human adaptation of avian H5N1 virus hemagglutinin.